Would you mind sharing a link to the one you found? I like having options. What did you like about the one you bought? I know you did your homework. Sure, here’s what I found. I didn’t do as much homework as usual on this one, so I’m not recommending it yet. 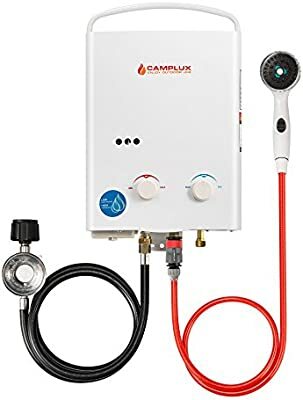 I relied less than usual on Amazon’s reviews, because reviewers seem to complain about all portable tankless heaters regardless of brand or size. This is “Amazon’s Choice” which is usually pretty good, it’s cheaper than the Eccotemp which seems to be the incumbent. The price point was very good. If it doesn’t work, I can return it easily enough. Capacity wise, I didn’t need one as big or high quality as yours. I am going for propane saving and warm weather use (less degrees of heat needed). It claims to run on low water pressure, which is nice if we want to hang up a bucket in a tree to feed it. I do also have a 12v water pump available. Comes with a shower head with a shutoff switch, which looks half decent. I can replace that if needed. This should do fine for us for a summer or two. If it lasts beyond that, great. Otherwise, eventually I’ll have the time to build a TLUD based heater like Gary mentioned, and of course once we live there I’ll feel more comfortable about wood-fired water heating (ie keeping an eye on it while lit). Yup, if you ever build a add on to the place , build it around the chimney on that side of the house. That would take care of the problem of the chimney being on the outside. You got to love us, we are full of great ideas. Looking good! An outdoor shower is great in the summer. When I first set up our yurt I used an eccotemp. The first one froze in the first winter, and started leaking - the second one lasted about 3 years and still works fine. I have since upgraded to a Takagi, which needs AC power, but is a real dream. My 2 cents of advice: put the water heater close enough to the shower to reach the knobs yourself. We had ours out in the shed, and you needed a spotter to go adjust the temperature up and down. We drew little numbers on the dial so we could find the right mix. Those basic units do not make any adjustments based on the water pressure or incoming water temperature, so it can swing the temperature quite a bit. So, here’s a bit of the attic and that load bearing wall I want to open up. It’s a sort of cantilever design, the rafters go past the wall by about 3 feet or so, meet the joists which overhang the (old) exterior wall. Kind of hard to describe, just watch the video. That’s some building / carpentry concept they did there. Sadly why we have building permits and inspectors, common sense isn’t very common. Apparently it has worked as a roof system for decades, but from what you show, the roof structure is very poorly attached to and haphazardly supported by the wall structure. I would be concerned about total failure in a strong enough wind, or perhaps a heavy snow load, though that probably isn’t so risky in your location. So this journeyman carpenter says that is all kinds of strange! That mid length support for the rafters looks like it was supposed to be a pony wall of some sort or it could have been hammered in later because of roof sagging. Mid summer it does nothing but put a ft of wet snow on it… I’d love to see it rebuilt to disribute load. Should be no big deal opening it up anf sizing a beam based on a single story span table but the trick will be figuring out bearing downwards. What is that wall resting on? Is it possible to figure out what the point loads you will create go down to? 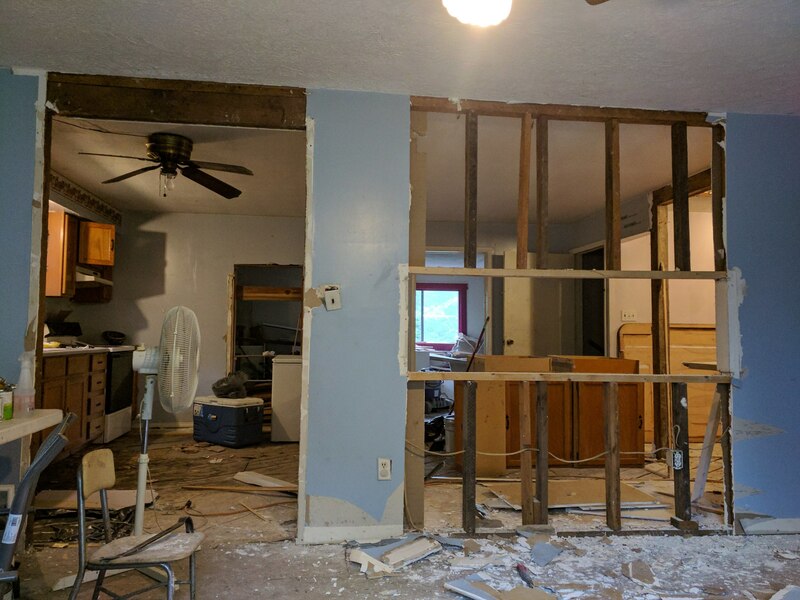 Big difference between a long wall and two 4x4 posts 10ft apart… Are you thinking beam below the roof joist or cut in flush? Below… easy cut in flush… not easy. Finally please in the name of all that is holy purchase a hepa rated respirator(purple); that cellulose is a breading ground for 10 kinds of nasty plus will have who knows what mixed in to it. I am with David I think someone probably added those braces later to tie the roof into the wall because it was sagging. Not sure why they wouldn’t be over the door. But it looks like an afterthought to me. I would also agree a under the wall beam with posts the easy way to handle that is posts all the way to the foundation. I have done this in old homes where the structure was sagging. It is amazing to me how some old houses where built especially if you find one built during WWII when all resources including wood was hard to come by because of the war. at a guess they are not over the door because when they put one there there was no decent header over the door and it compressed down binding the door… Ahh old houses. Chris, you and Mary do not fuss too much about “perfections”. The house my wife and I live in started out in 1906 as four rooms on the ground floor with an outside stairs on the covered back porch to access the two upstairs bedrooms. That rear porch got torn off and an enclosed shed addition put on in the 1940’s. The stairways then moved internally central. STILL had no internal bathroom, toilet, laundry area. My father-in-law added a internal toilet&shower stall into one downstairs bedroom corner with a gravity septic system in the 1950’s. Now ALL of this was still spanning a few sawn-off western cedar stumps and layed down local flat rocks, and sawn beam. The “later” 1940’s onto just layed down cinder-block beam footers. Groan. So that old, now permanently attached to the extension doubling we did back then (required to be on a modern concrete foundation) continues to slowly leaning-tower sink and settle!! 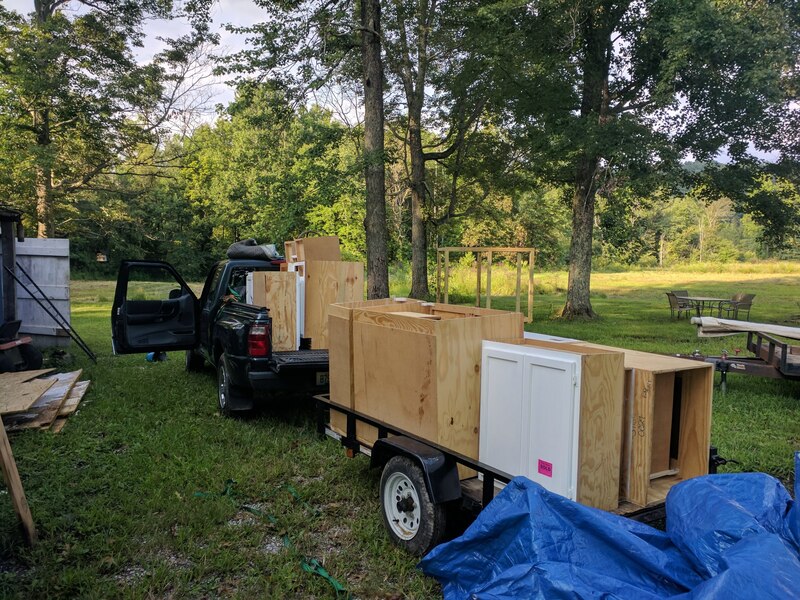 Father-in-law had wanted us to bulldoze it all down and just move in a manufactured home into it’s place. Wife wanted her girl childhood rainy day play house to live out the rest of her life in. Ha! At 62 now she will have this. We will live out here. Die here. Then, the bulldozers can come. And our sub-standard house in now very tax reduced without that foundation. CANNOT be used as an enslaving never-ending home-loans ATM machine. You and Mary are head and shoulder above the majority of the current-culture enslaved by pursuing rural home/farm ownership. Stay far, far away from “bank” houses and barns. Current-culture has so, so many resource draining/distracting 'autta-haves, must-haves with us all being bled weak for others benefits. The reality touch-point could be the old “Five Acres and Independence” book. If it ain’t a current available version of what is in there for rural/farm fuctioning/building; best to say - Pass-No. On my way out to the big county annual Fair and practicing that mantra to not get sucked in on blowing up my monthly very limited budgets on huckster spins. Stay far, far away from “bank” houses and barns. when one is young, and that one has many testosterone and in good soldier, one engages loans, result, one is the slave of his banker, his accountant, and the state where every month, he I have to pay the taxes, after having recovered from an illness, I lowered the veil, now happier and master of my life. Above all, do not forget to be happy, because life passes quickly. Quick update. We’re still tearing away the useless bits and preparing to replace them with new. A few pictures to tell the story. 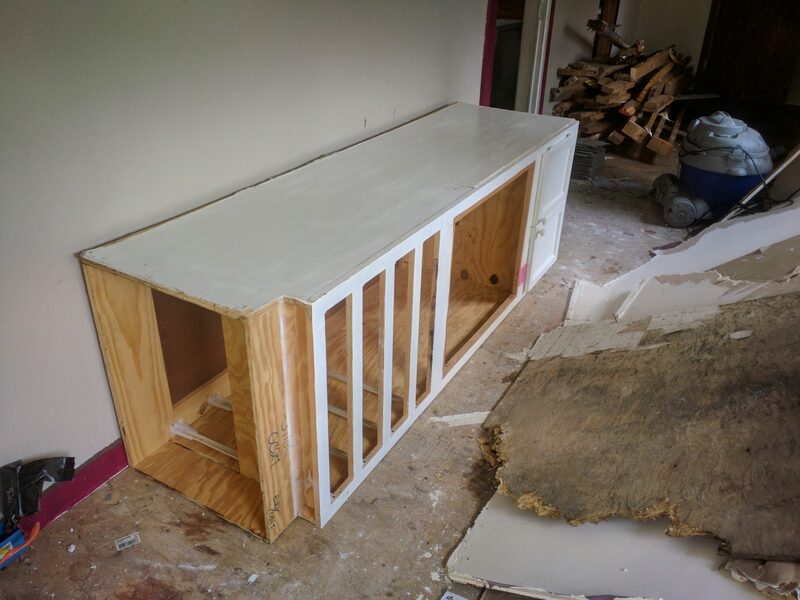 Walls are mostly gone, old cabinets coming out. The right wall opening will become a doorway, but I have to build a header for it. The new doorway from a different angle. 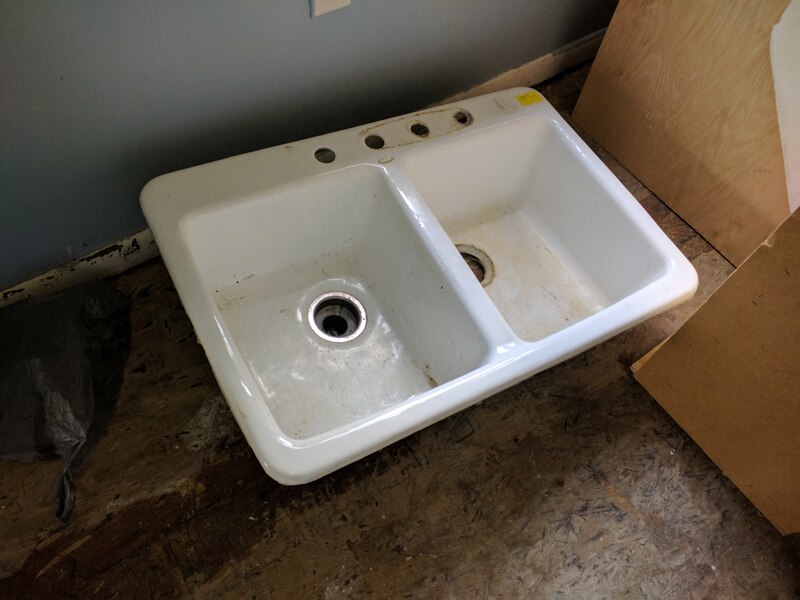 It was a pass-through kitchen counter, poorly framed (this is a weight-bearing wall). The old doorway (left) will get framed in, providing a corner for the kitchen. Much improved traffic flow and more counter space. 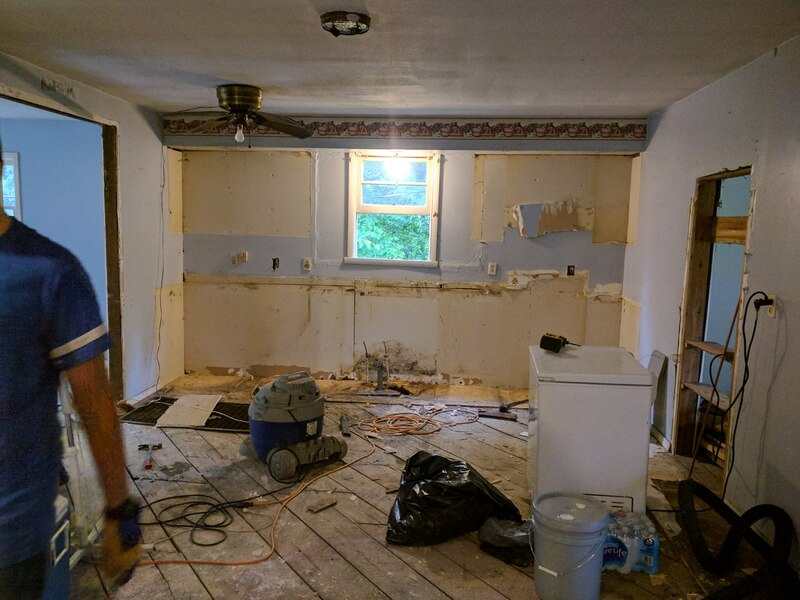 Old cabinets are gone. Notice also the underlayment is removed, exposing the diagonal subfloor boards. Very nice older building style. We will lay prefinished hardwoods directly over this. 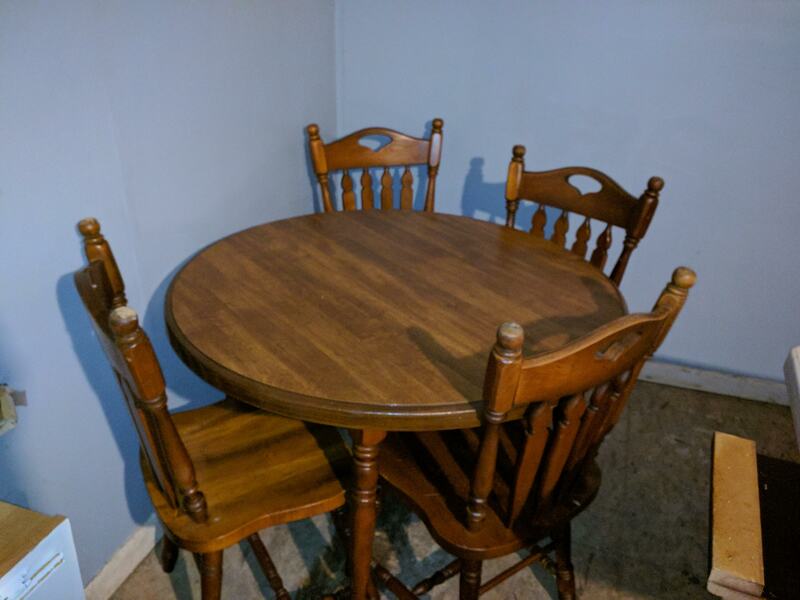 By the way, if you’re looking for cheap hardwoods, try reallycheapfloors.com. They have prefinished utility grade flooring for $0.99/sqft. It’s a lot of shorts and culls, but a significant portion is usable. 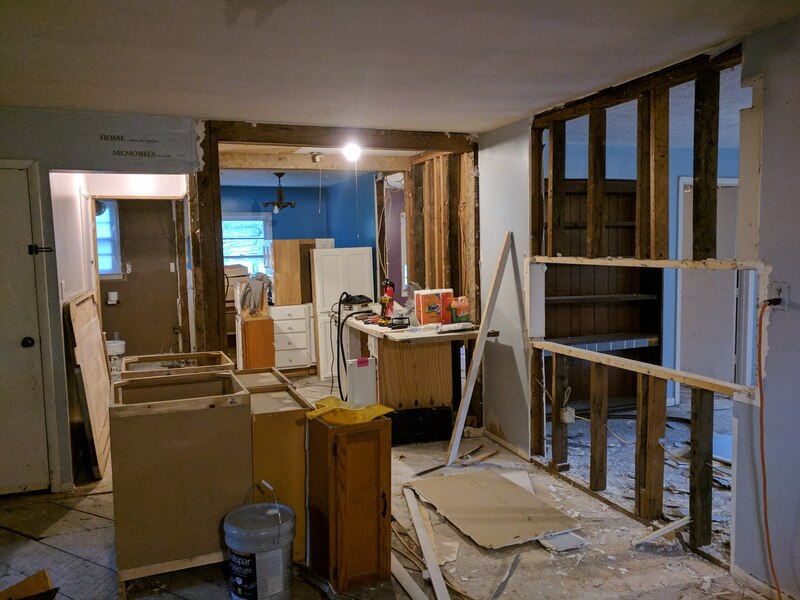 The basement has been mostly gutted. The wood pieces went in a giant bonfire. On the one hand I hate to see the “fuel” being wasted. But on the other hand this was paneling, OSB, old rotten boards, and 2x4s full of nails. Getting it through a gasifier would have been way too much work. Looking good. I don’t know if you guy use much heat down there but construction waste makes great fire starter for a wood stove. Yes, I saved back plenty for kindling. 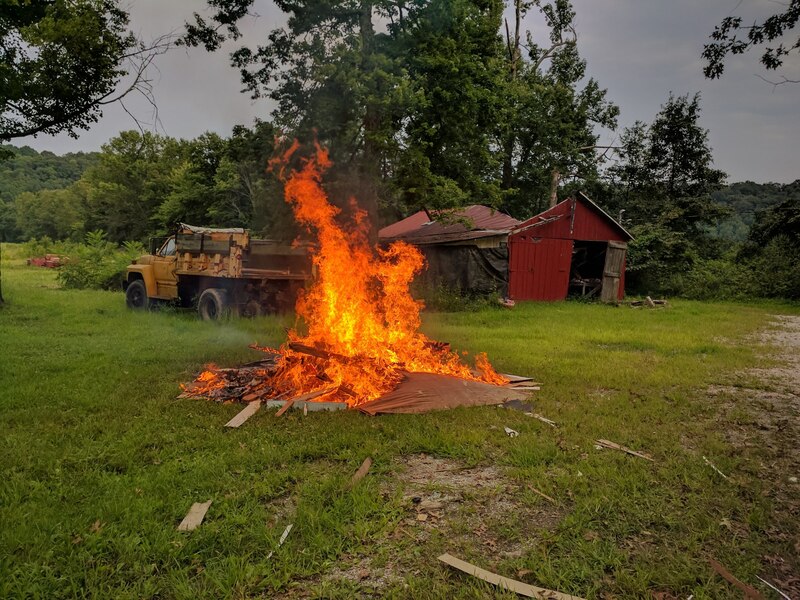 This house continues to produce wood waste, we’ll probably need a second smaller bonfire at some point. Looks like you are having fun together making your old house a home. Make sure you screw those diagonal sub floor boards down unless you enjoy the “old house squeak”. That shed in the background will make lots of kindling!